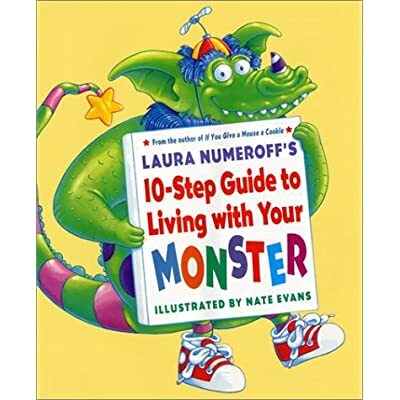 Laura Numeroff is perhaps best known for her “If You Give a…” series (“If You Give a Mouse a Cookie”, “If You Give a Moose a Muffin”, etc.). Ten Step Guide to Living with Your Monster is lesser-known, though just as great. This whimsical spin on monsters explains how one should select and care for a pet monster. This book is perfect for dispelling monster fears as it exposes them for the silly characters they really are! After reading about pet monsters, have the children do a whole language or journaling activity. At the top of the paper, print the question, “What kind of monster would you have for a pet?” Have the children dictate their answers to you as you write them on their papers. Be sure to draw their attention to your writing, pointing out the words, reading the sentence back to them, and even modeling some thinking out loud about letters and sounds or how to write a certain letter. You may even want to “share the pen” and have them write a particular letter or word you know they are capable of. Read the finished product back to them so that they see that their spoken words are now recorded in written words. Of course, give them plenty of room to draw illustrations of their monster pets. Remember that young children often do their writing by drawing. Use tips from Do the Write Thing to maximize this language and literacy activity! This type of activity increases language and literacy skills as it builds concepts of print and also encourages creative expression. Tie this in with the Monster Boogie on the previous post to add some music and movement to your activity! I’m sorely tempted to go to Barnes & Noble for this right now! It’s a fantastic book! And B&N has a great new feature where you can go online, select your book, and have it waiting at the counter for you in 30 minutes! Not that that info will help with your temptation!